For one hundred years people have attempted to climb to the peak of Mt. Washington faster than anyone else. Travis Pastrana beat the record by 20 seconds in a Subaru WRX STI. On his first try. Watch his Subie dance. Mt. Washington is home to the "Climb to the Clouds" rally, i.e. that other hill climb. And while it doesn't have quite the cachet of Pikes Peak, with over 100 turns and a summit 6,288 feet in the sky it's still a challenging and gorgeous track. Pastrana, not surprisingly, has his way with it. 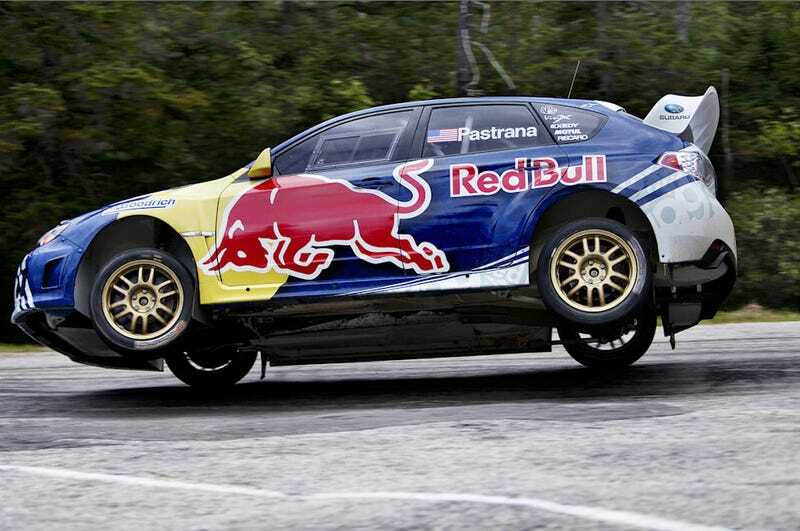 In addition to jumping over things on TV, Pastrana makes a pretty good living winning rally races. Frank Sprongl set the record in 1998 in an Audi S2/Group B Quattro with a time of 6:41.99. On his first run Pastrana surpassed Sprongl's time by clicking off a 6:20.47. His next attempts were hindered by bad weather and he was thus slower. We also have video of the former record-setting run, but because Sprongl wasn't backed by a fleet of energy drink-sponsored/addicted cameraman, the quality isn't as good. The driving, though, is stellar. Compare.